The lowest price of Bharat Lifestyle Cosmo Plus Fabric 6 Seater ( Finish Color - Black Grey ) is at Amazon where is it is for INR 14000. This price is INR 999 lower than the other price for the product. The prices for the product change across variants. 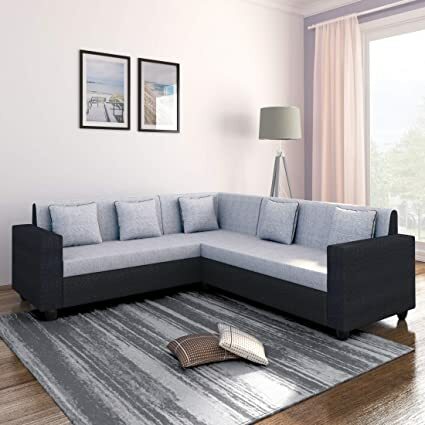 The price for Bharat Lifestyle Cosmo Plus Fabric 6 Seater ( Finish Color - Black Grey ) is valid across Bangalore, Hyderabad, Chennai, Mumbai, Delhi, Pune and Kolkata. The Bharat Lifestyle Cosmo Plus Fabric 6 Seater ( Finish Color - Black Grey ) is available at best price of INR 14000 on Amazon. Care Instructions It is always advisable to keep your furniture away from direct sunlight and places with high humidity levels. Always use coasters or mats to keep any hot object on the wooden furniture as it may get damaged by causing white rings or marks. Don’t use any strong agents to clean the furniture unless mentioned otherwise. Keep pointed and sharp objects away from your furniture as they can cause permanent scratched. Warranty Service Type Customer needs to Mail us the details of the damage with photographs, to process such claims. Not Covered in Warranty Warranty does not cover for Improper Handling and any kind of natural wear & tear. - The color of the product may vary slightly compared to the picture displayed on your screen. This is due to lighting, pixel quality and color settings. - Please check the product's dimensions to ensure the product will fit in the desired location. Also, check if the product will fit through the entrance(s) and door(s) of the premises. - Please expect an unevenness of up to 5 mm in the product due to differences in surfaces and floor levels. - Flipkart, or the Seller delivering the product, will not take up any type of civil work, such as drilling holes in the wall to mount the product. The product will only be assembled in case carpentry assembly is required. - In case the product appears to lack shine, wiping the surface with a cloth will help clear the surface of dust particles.